Distributors' needs for managing item substitution go beyond Microsoft Dynamics 365 for Finance and Operations. Distributors commonly offer customers a different product if the ordered item is out of stock, or a cheaper product with the same functionality is available. This is product substitution. Distributors should consider substitutions to improve customer satisfaction, margins and inventory management. Standard Dynamics 365 for Finance and Operations is limited to offering alternate items only if an item is not available in inventory. But distributors need more flexibility; this app empowers distributors to create rules that offer alternatives based on relative margin, customer satisfaction and other factors, rather than just when an item is out of stock. The ENAVATE app applies these rules seamlessly during order entry. Greater Customer Satisfaction: Ensure that customers don’t have to wait because a product is back-ordered. Offer substitutions when an alternative is available. If a customer does not want a substituted item, ENAVATE’s app allows specific-customer inclusions and exclusions. Increased Margin: It’s not just about back orders. Improve your margins with a proactive substitution management strategy. And ENAVATE’s substitution parameters and business rules ensure that subbed items won’t deteriorate margin. Improved Inventory Management: Take control of your inventory investment. 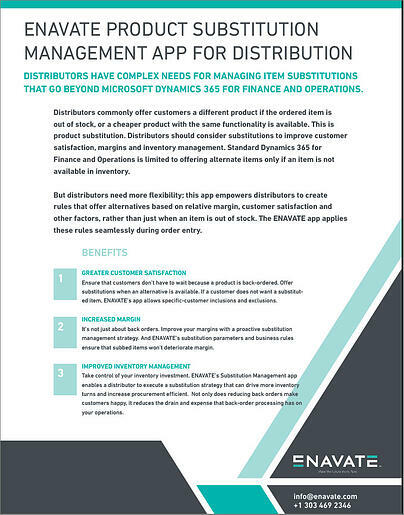 ENAVATE’s Substitution Management app enables a distributor to execute a substitution strategy that can drive more inventory turns and increase procurement efficient. Not only does reducing back orders make customers happy, it reduces the drain and expense that back-order processing has on your operations.